Classic with just a funky touch, this buffet is ideal for a modern home full of guests and a need for an entertaining station. The buffet also has lights inside to showcase your tableware when not in use. The Arts and Crafts line of furniture is known for its charmingly modern style of geometric details and subtly curved panels. Shown built in Quarter Sawn White Oak with FC-10901 Golden Brown stain. 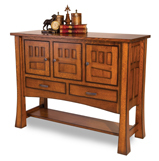 Built for dining room storage, the Arts and Crafts buffet is an elegant way to showcase your tableware. The hutch fits perfectly on top of a cabinet so you can start with one piece and add the hutch at a later date when your home becomes bigger and busier. Buffet base height is 34"
Pictured built in Quarter Sawn White Oak with FC-9018 Lite Asbury stain. Give your most beautiful treasures the love they deserve in an Amish hutch or buffet. Amish hutches are handcrafted, so they are a fine match for the beauty of heirloom china or figurines. Hutches' glass doors display your valuables while protecting them from dust, saving you the work of polishing them and the risk of handling them more than necessary. The hardwood is beautiful enough for your dining room, keeping your best tableware near your dining table and making entertaining a breeze. A hutch showcases your heirlooms over a base known as a buffet. Solid wood buffets are more practical cabinets at or near table height, excellent for storing silverware, table linens, or wine at room temperature. In addition to standalone buffets, nearly all of our hutches have an option to order the buffet only. There is an Amish hutch or buffet for any dining room. Many designs include three and four door versions to match your ideal width. There are also corner hutches. Some buffets suit particular needs with wine racks and pull-out surfaces. Hutches can have open or closed decks depending on your storage needs. A closed deck hutch supports the glass cabinets directly on the buffet to showcase large china collections. An open deck hutch lifts the cabinets several inches and keeps the buffet surface available for frequent use such as displaying plants, transferring dishes or signing the guestbook. To emphasize the sheen of your valuables, many hutches have options for lighting, with glass shelving to let the light through, and wood or mirror backs. Amish hutches and buffets come in every style from traditional furniture to rustic. Our furniture is handcrafted by Amish workshops in the USA. If the dining room is the pride of your home, then an heirloom hutch is the pride of any dining room.